The basic crunch is the consummate abdominal exercise in a strength-training program. Pay special attention to your form when you do crunches, especially if you have lower-back or neck problems. Curl up to work on your abs. 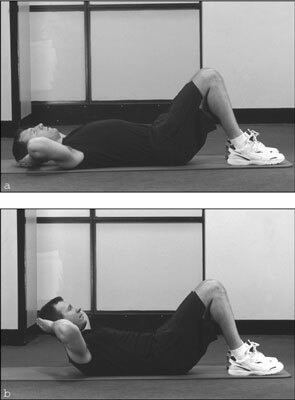 Keep your abdominals pulled in so you feel more tension in your abs and so you don’t overarch your lower back. Don’t pull on your neck with your hands or draw your elbows in. Perform crunches very slowly and with control, doing 12 reps. Sit on a physioball and roll your torso down so that your back — from your shoulder blades down to your tailbone — is resting on the curve of the ball and your head, neck, and shoulders are above the ball. Your knees are bent, and your feet are planted on the floor, hip-width apart. Perform the same abdominal curling movement as you do for the basic crunch. You have to move slowly and keep your abdominal muscles fully engaged to keep yourself from wiggling around on the ball or rolling off of it. 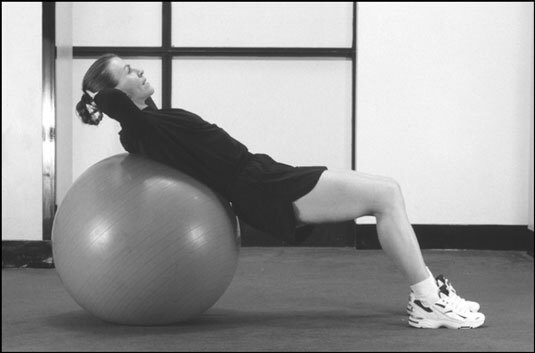 You can perform the basic-crunch movement on a physioball as an alternative to the traditional exercise.